You take the wooden boardwalks to your abode, which is a classic white guest room located amongst the 3 uniquely designed guesthouses that make up the property. Your room is delightfully styled with a modern luxe, ocean inspired theme. White interiors and bedding, and a mixture of blue and grey tones that blend to create a fresh and rejuvenating welcome. The space is so inviting that many just perch themselves on their private balcony’s, but if you do escape the seduction of your room, you’ll find lush tropical gardens, a turquoise lap pool and cosy spaces around the property, enticing you to laze away your days in a beanbag under the verandah, read a book on the day bed or gently swing the afternoon away in a wicker pod chair. There are multiple communal kitchen spaces too (that in no way resemble anything like the communal kitchens you may have in your mind). These are meticulously styled, state of the art kitchens that are perfect for a summer evening bbq with friends, a delicious Sunday morning cook up or a space to whip up a cocktail or two, before heading out to enjoy one of Byron’s fine eateries. 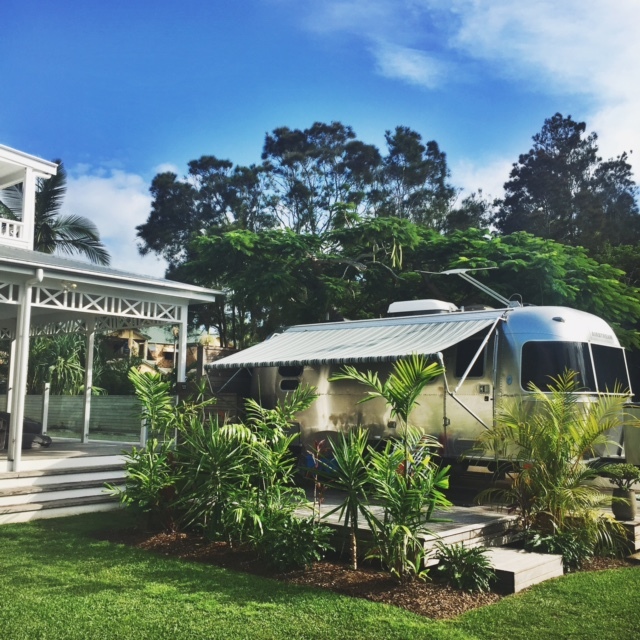 The centrepiece of the property is the opportunity to stay in a vintage American Airstream. Restyled and renovated with all the mod cons, it’s the ultimate in ‘glamping’ and a novelty that keeps it booked out month after month. The Atlantic also offers their guests the use of the all too popular ’roundie’ beach towel, by ‘The Beach People (Link: http://thebeachpeople.com.au ), Surfboards (long and short) to explore the many picturesque beaches and rolling waves that surround Byron Bay and free wifi (So you can share one of your dreamy shots and make everyone at home green with envy). Nestled in the heart of Byron, minutes from the beach with a tropical rainforest backdrop (and far enough from the riff raff), The Atlantic have gone out of their way to create such a dreamy space that will have you wishing you never had to leave. ‘The Lodge’ one of the guest houses that makes up The Atlantic. One of the cosy nooks you could find yourself unwinding with friends. Your private balcony space to curl up with a book. One of the state of the art communal kitchen spaces. Yep, I could stay here all day thanks! A second kitchen space for guests to make use of. Your home away from home, a classic room. Which room type and house in the property did you stay in? Ta! hi! So sorry for the delay in my reply on this, but I stayed in the ‘Tropical’ room category, which is in the main section of the house. It was lovely!